Enjoy winter’s magical moments from one of the most picturesque landscapes Europe has to offer on this 9-day tour. The journey begins in Zurich, the largest city in the Swiss Confederation. The varied architecture of the city sits against the snow-capped mountains, and excellent shopping meets famed museums and landmark sites. 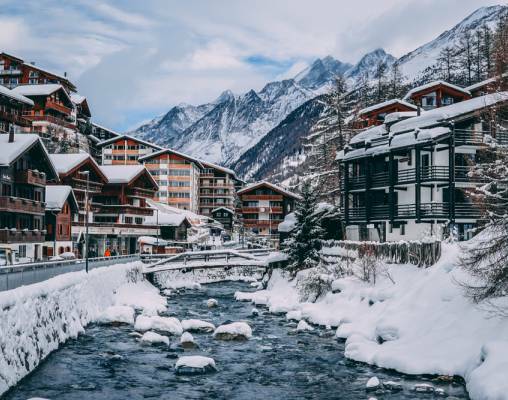 From Zurich, the tour moves onto the quaint village of Sils-Maria and then onto the resort town of Zermatt, where winter sports reign supreme. From Zermatt, you enjoy time in the capital city of Bern before moving back out to the countryside for a look at the astounding beauty of Interlaken. While you will have plenty of time to explore each destination on your own, you also enjoy fantastic excursions such as a boat cruise to Interlaken, rides aboard three renowned railways and even a horse-drawn carriage excursion. With so many destinations and experiences, there is truly no better way to experience Switzerland in the winter. Today your international flight will arrive in Zurich, Switzerland. When you land, transfer to your centrally located hotel. You will have the rest of the evening at leisure to get acquainted with the city. Overnight Zurich. This morning, your grand adventure begins. After breakfast, transfer to Zurich Main Station to board a train bound for St. Moritz. The journey takes between 3 and 4 hours to complete, and along the way, the scenery is quintessentially Swiss. Charming villages sit at the base of rugged mountains, and open valleys meet lush evergreen forests. As the train arrives at the station in St. Moritz, you will be transferred to Hotel Waldhaus in Sils-Maria. Here, you will be able to enjoy winter sports, such as skiing, snowboarding, winter walking, sledding and more. Alternatively, pamper yourself in the hotel’s onsite spa. Overnight Sils-Maria. The highest continually populated valley in the Swiss Alps, Fex Valley - or Val Fex, to the locals - is a beloved destination all throughout the year. You are lucky enough to get a peek at it today as you embark on a horse-drawn carriage ride through the powdery landscape. Peace and tranquility will surround you as you set out through the valley, taking in the contrast of the untouched white mountains and the varied man-made sites. Following the ride, you will return to Hotel Waldhaus, where the rest of the day is yours to experience the region however you please. Overnight Sils-Maria. Enjoy a hearty winter’s breakfast, then meet your driver in the lobby of your hotel. He will transfer you to St. Moritz train station, where one of the most beloved trains in Switzerland awaits your ascension, the Glacier Express. As the train pulls out of the station and begins moving toward Zermatt, the sights change from beautiful to simply enchanting. Over the course of 8 hours, you will move along mountains and forests, across viaducts and through tunnels. Large picture windows allow you to take in all the splendor as the train winds through the countryside and the three cantons of Valais, Uri and Graubünden. Your eyes will not be the only things that are delighted; your taste buds are in for a true treat, as well. Before reaching Zermatt, you will be served a three-course lunch aboard the train. The meal will begin with a salad, then you will enjoy a well-portioned main course followed by either cheese or dessert. All of the ingredients are locally sourced, and the meals are freshly prepared onboard by experienced chefs. Each course is paired with regional wines to enhance your dining experience. As the train pulls into the station, you will transfer to your hotel on your own. Overnight Zermatt. 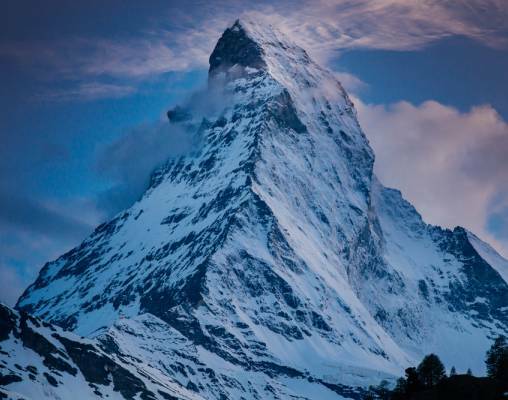 As you wake this morning, look up; the pyramid-shaped Matterhorn is one of the most magnificent sights in Zermatt. You will have the morning to look around the town, to peruse its shops and to marvel at its wonderful mountain surroundings. Later, meander to the center of the village to board the Gornergrat Railway. On this train, you will ascend 3,089 meters to Gornergrat and enjoy a breathtaking, up-close view of the Matterhorn. It takes 33 minutes to get to the top, and once there, you can get out and take in the winter wonderland from the station’s viewing platform. When you get back down the mountain, the rest of the day is yours to ski, snowshoe, take a winter hike or to enjoy the amenities your hotel has to offer. Overnight Zermatt. This morning you will board your train bound for Interlaken. The route will take you on a northerly journey through the incredible Swiss landscape, passing by quaint mountain towns and offering spectacular views over the Alps. The ride is just over 2 hours in length, and upon arrival, you will have the rest of the day at leisure. Whether your interests lie in museums, breweries or natural sites, there is something in Interlaken to keep you busy. Alternatively, your centrally located hotel will be chock-full of amenities to keep you warm and relaxed. Overnight Interlaken. Some of the most iconic sites in Interlaken are the peaks of the Swiss Alps, and today, you will take in those of mounts Eiger, Mönch and Jungfrau from yet another fantastic railway, the Jungfrau Railway. The excursion will begin in Interlaken on the Bernese Oberland Railway. You will follow the route to Lauterbrunnen or Grindelwald, at which time you will change over to the Wengernalp Rack Railway. The train will arrive in Kleine Scheidegg, where you will board the Jungfrau Railway to climb to the top of the mountain. When you get to the highest railway station in Europe, you will be able to look over the surrounding mountains, shop, hike or explore the ice palace. In all, the journey to the top takes approximately 2 hours. Upon returning to Interlaken, the rest of the day is at leisure. Overnight Interlaken. Today you will see the Swiss landscape from another perspective: the water. From the harbor in Interlaken this morning, you will board a lake cruiser for a scenic adventure across Lake Thun. Take in views of castles, soaring mountain peaks and charming tree-lined villages. As the boat arrives in Thun, a high-speed train will take you to Bern, where you will transfer to your hotel for check-in and have the remainder of the day at leisure. There are a number of elegant cathedrals and museums to explore, as well as famed sites such as the Child Eater Fountain and the Clock Tower. 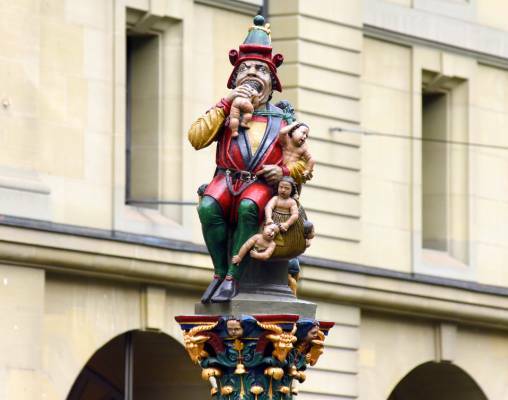 The dining scene in Bern is incredibly diverse and will allow you to sample local cuisine or to enjoy international favorites. Overnight Bern. After breakfast this morning, you will transfer back to Zurich via train. When you pull into Zurich HB train station, you can continue on your journey by train or transfer to Zurich International Airport for your return flight home. Hotels commonly used are the Baur au Lac, Zurich, Carlton Hotel, St. Moritz, Grand Hotel Zermatterhof, Zermatt, Lidner Grand Hotel Beau Riavage, Interlaken, and Hotel Bellevue Palace, Bern. Hotels are subject to availability, substitutes will be of similar quality and amenities. 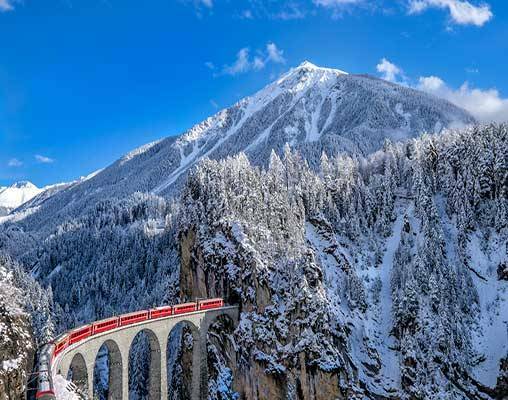 Taking travelers on a scenic route through the Swiss Alps, the Glacier Express connects the cities of Zermatt and St. Moritz in Switzerland. The train follows a route that takes travelers through cantons and lesser-seen parts of the Swiss landscape. Highlights along the way include views of the Matterhorn, Solis and Landwasser viaducts and spiral tunnels, the Rhine Gorge and Oberalp Pass. In all, the journey takes approximately 8 hours. The Gornergrat Railway set off on its first journey in 1898, and ever since, it has been taking passengers to peak of the Gornergrat. This train sets off from a railway station in the city of Zermatt and makes its journey to the top in just over 30 minutes. Once at the summit, passengers have access to the highest hotel in Switzerland and the highest shopping mall in Europe. Prized for taking its passengers to the “Top of Europe,” the Jungfrau Railway dates back to the late 1800s. This mountain rack railway climbs over 3,450 meters to the highest railway station in Europe during each of its many daily trips. Passengers enjoy mountain views and a journey through a long tunnel as they make the 9-kilometer ride up the Jungfraujoch. Enter your details below if you would like to be notified when 2021 dates and prices are available for Deluxe Switzerland in Winter.